We have been watching owls in our backyard since about 2006. 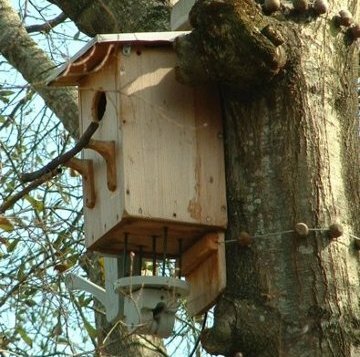 In 2007, our first nest box went up, but the owls chose to nest elsewhere in a natural tree cavity, and raised at least three owlets. In January, 2008, we installed a video cam in the Euclid St. box and were delighted when owls nested in the box and successfully fledged four owlets from four eggs. 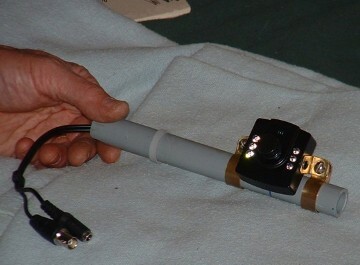 In January, 2009, we added a microphone so we could listen to adults and nestlings, and the owls again fledged four owlets from four eggs. 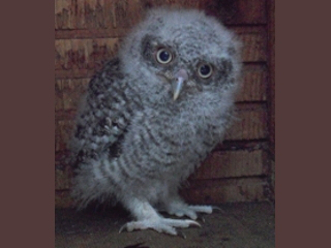 In 2010, the owls fledged three owlets from four eggs. Around September, 2010, the male owl disappeared, and we saw only the female at their customary day-roost sites. Such a contrast with previous years led us to speculate that the "old" male had met his demise. However, in February, 2011 a male owl (new bird?) appeared, suggesting a successful remating. During 2011-2014, this pair nested elsewhere, but used our nest boxes again for 2015-2019. 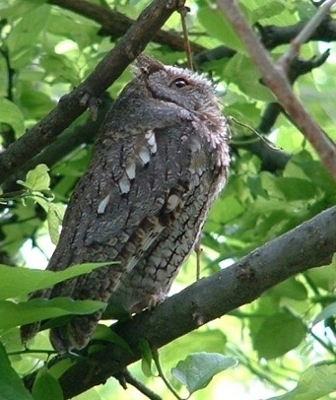 The following schedule may represent typical timing for screech owls in S.E. Texas, based on notes in our "owl log". Eggs are typically laid between mid-February and mid-March, and hatched about 30 days later. After eggs hatch, parents (especially the male) hustle groceries to the ever-hungry brood, including cockroaches, katydids, moths, geckos, snakes, and birds. The owlets fledge (bail out of their nestbox) about 30 days after hatching. They climb as high as possible into their nest tree. They are flying from tree to tree in a couple of days, and for the next 8-10 weeks, follow their parents around the neighborhood, begging for food and (hopefully) learning to hunt. During this time, the parents are protective, bill-clapping and hooting if they feel their young are threatened. In June, 2008, one of the juveniles was killed by a prowling white cat in the neighborhood (side note: if your cat doesn't depend on birds for food, please put a bell on its collar). By mid-July the juveniles appear to have dispersed to their own new territories. By August the parent owls at Euclid St. are back to their customary summer roost, under a grapevine in our side yard, seen most days at dawn and dusk. With the onset of winter and shedding leaves, the owls shift their daytime roost trees, typically settling into an always-leafy liveoak by late December. Between December and February, the owls (mostly the male?) make frequent scouting visits to the Euclid St. box. On most winter days, the male and female owl roost close together in the foliage of their favored liveoak, but on occasion, the male owl will spend a day roosting inside the nest box. During December-February, we sometimes observe mating behavior. 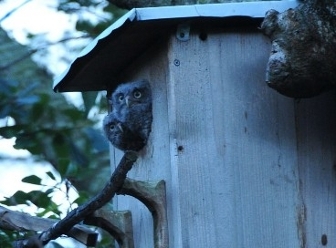 Excitement builds, when and IF we see the female owl start roosting in the nest box (typically, mid to late February). Then we start hoping we may be about to share another season of nest viewing with our owl-watching friends. Many thanks to Chris Johnson in Austin, whose web site provided a lot of information and encouragement.